In some materials such as hard sand stone and quartzite, the wear tends to be greater on the drill bit circumference. Thus, when the buttons are sharpened, the diameter across the gauge buttons will be less than the diameter of the drill bit shoulders and the drill bit will tend to bind in the hole. Consider drill bit replacement. When drilling in non-abrasive materials, where carbide wear is minimal, extended drilling intervals are possible. This allows for prolonged chip removal around the drill bits and will wear away the drill bit body to a greater extent than the buttons. Similar wear occurs in fractured and loose materials where excessive agitation and grinding of the materials is required for hole cleaning and to keep the hole open during retraction. To prevent tearing out buttons and button shear under these conditions, the protrusion should be reduced by scheduling grinding intervals to grind down the buttons. The detrimental effects of over drilling, drill bits may not be immediately apparent. However, running dull drill bits not only slows down the drilling rates but escalates drilling costs by reducing life on the drilling tool components, the rock drills and the drill rig components. Premature button bit insert failures are reduced substantially when over drilling is eliminated and proper sharpening is performed. Carefully read and follow the below safety warnings and instructions prior to engaging in work with equipment. • Always follow equipment manufacturer’s recommendations for safety and maintenance. • Always wear personal protection equipment, including: steel toed boots, work gloves, safety glasses and hard hat. Be familiar with the safety requirements of your work site. • Always wear hearing protection when the work environment includes noise levels at or above 85 db. Dual hearing may be required when percussion drills are operating. • Never operate equipment while under the influence of drugs, alcohol, medication or extreme exhaustion. • Stand clear of all moving and rotating equipment parts. Never wear loose articles of clothing around moving equipment parts. • Be cautious of other equipment operating around you. • Always maintain a clean working area. • Avoid extremely hazardous working conditions. • Refrain from having unnecessary visitors to your work area. Ensure any visitors are dressed properly for the working conditions they are entering. • Always use and keep machine safety guards intact and in working order. • Employ trained and experienced service mechanics to maintain and repair equipment. • Always follow all local and federal health and safety regulations. • Prior to moving equipment or operating equipment controls, always be sure of what function they perform. Always know where other persons are prior to moving equipment. • Prior to lifting tools with hoists, make sure that all rope and/or slings are free to move without getting tangled. The optimum range of hole size for blast hole drilling with DTH is 90 mm to 254 mm (3"-10"). Smaller blast holes are generally drilled using top hammer, and larger holes generally use rotary machines. In other applications, like foundation drilling, DTH hammers can be used with single bit in hole sizes up to 750 mm (30"). With multiple hammer units CD (Cluster drills) drill holes up to 1778 mm (70"). Titan hammers are purpose-matched for all rock types and applications. Where high performance is the main criterion, Titan A series fast hammers are recommended in blast hole drilling and Titan traditional with foot valve hammers in deep hole drilling applications. 1. To ask is whether the casing should be permanent or retrievable. This will influence the further choices. 2. To investigate is what casing size is used by determining outer diameter of the casing pipe and wall thickness. For permanent casing, both thick and thin wall casing can be used, while a thick wall casing is needed for retrievable casing. 3. To get a good insight of the application and requirements for the system. For example what kind of hammer is used? 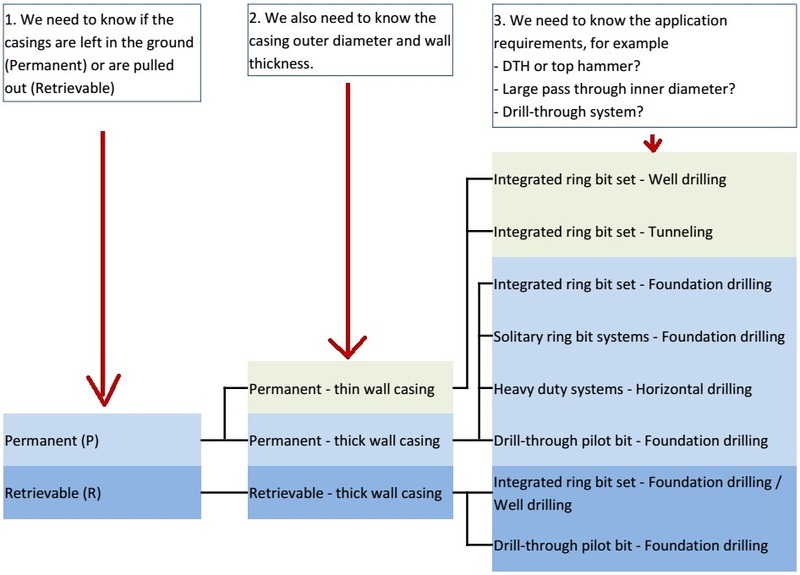 Is drilling continued through the ring bit after the casing has been installed? Is the drilling horizontal or vertical?